.A media company has caused a stir on social media after rejecting a male corps member deployed to their firm for his one year service. 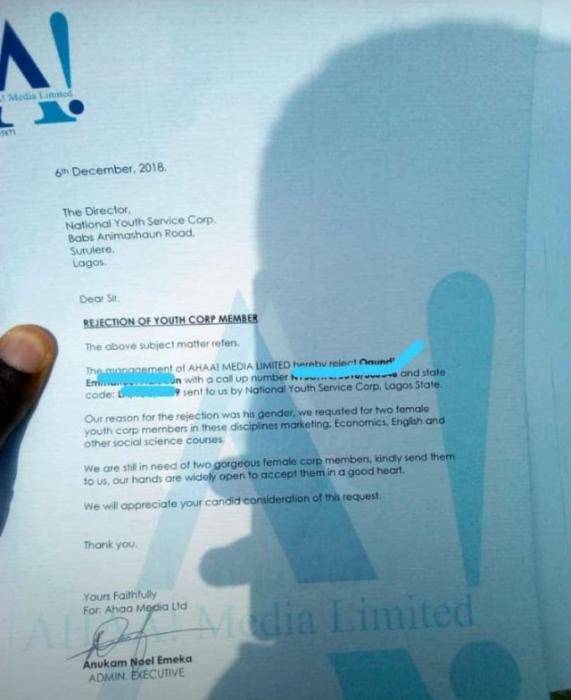 The media company rejected the male corps member and stated in the letter addressed to NYSC that they specifically need 2 gorgeous ladies to work in their company and not a male. The viral photo is raising eye brows on social media. “Our reason for the rejection was his gender. We requested for two female youth corp members in these disciplines, marketing, Economics, English and other social science courses. We will appreciate your candid consideration of this request.